Small to medium life sciences companies need fast, compliant and cost-effective ERP/CRM implementation and validation, but many are left with just an idea and a promise. 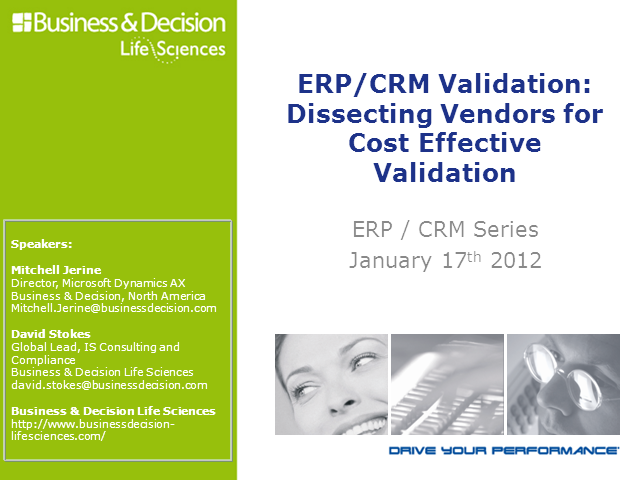 Take advantage of our life sciences and system validation experts to learn what to look for when selecting ERP and CRM software vendors and systems integrators. Discover how to leverage vendor Software Development Life Cycles (SDLCs) to support a cost-effective and risk-based validation, as well as how to resolve the conflict between cost, time and quality. This is the third in a series of five live webcasts by Business & Decision life sciences experts designed to help you optimize compliant business processes, reduce operational costs and improve margins.